BETZ CREEK PLANTATION. NEW ROOF Move in today! One level living. Open floor plan, vaulted ceilings. Great room with fireplace. Dining room open to great room. Laminate/wood floors throughout. No carpet. Galley kitchen with tile floors, white cabinets, stainless steel appliances, laundry room with closet and shelves. Master bedroom with tray ceiling & walk-in closet, bath with tub.shower. Privacy fenced yard with patio. Double garage. No flood insurance required - X zone. 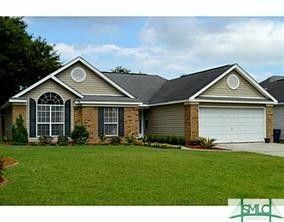 Cul-de-sac location - Only 15 minutes to downtown or Tybee Island. Great Islands school district, restaurants, YMCA & walking trail on Whitemarsh Perserve. Affordable Island Living in Betz Creek Plantation. Directions: Johnny Mercer to Walthour, left into Betz Creek onto Teakwood-take 3rd left on Barnacle, first right onto Runabout and 2nd left onto Bateau Court, home on right.